The Congenital Eye Disorder Program is designed with a “team effort” focus to provide patients and their families receive the best and full spectrum of care in one place to treat the whole person, instead of just the disorder or syndrome. This program consists of ophthalmic clinical care, related medical care from our other nationally ranked departments, education on the disorder(s) or syndrome(s) the patient may have, access to further support services, a gene/specimen bank for future research and several research study opportunities for patients. The latest in treatment care and research advancements will give the best future outlook for those with genetic eye disorders. There are various opportunities for the patients themselves to help lead these advancements should they choose. 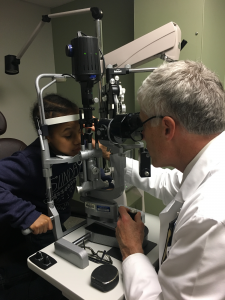 Participation opportunities to help advance knowledge are through the Congenital Eye Disorder Program, ongoing research studies in various UVA departments, data collection projects, and clinical trials. For questions or to make an appointment, please call 833-266-4361 or 434-982-0854 and choose option 1 for Dr. Netland. Genetic testing may help you understand the underlying causes of your or your child’s disorder, and help your physicians better treat the disorder or the symptoms it induces. Genetic testing does not include personal genomics. Results are best interpreted by a clinical geneticist or trained professional. When a patient with a congenital eye disorder or the parent of a child with a disorder contacts the Congenital Eye Disorder Program, they will be personally assisted through the process coordinating needs such as: appointments, financial assistance, obtaining medical records for the exam, discounted lodging, travel and local information to make their trip to UVA as stress free as possible. Once here for the appointment, they will meet with the Congenital Eye Disorder Team consultant who will provide information, answer questions, and share other opportunities related to research, clinical trials, data collection or other medical departments. They will then be accompanied to the clinic appointment where they will be examined and their Congenital Eye Disorder Consultant will assist with any suggested follow up care or services by the examining ophthalmologist.